Toronto police are investigating a report that a Banksy artwork was stolen from a Toronto exhibit curated by one of the artist's former agents. Police received a report Saturday about the possible theft of a painting from the Sterling Road exhibit in Toronto's west end, where the $35-million Art of Banksy exhibit is debuting as part of a larger North American run. The exhibit, by curator Steve Lazarides, was not endorsed by the artist himself and was set to open Wednesday. Both Lazarides and his publicist refused to confirm the report or comment on the investigation. The exhibit was set to show 80 of the artist's pieces and has a ticket price of $35, charged by Live Nation and Starvox Exhibits. 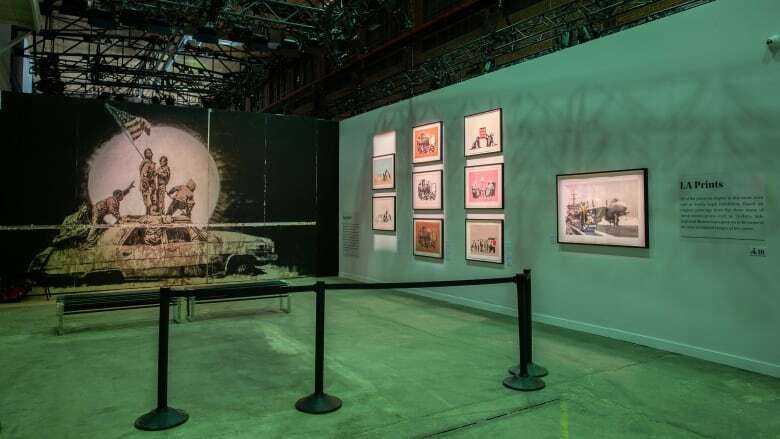 Asked earlier what the anti-capitalist artist might think of the public having to pay to see his work, Lazarides told CBC News earlier this week he felt Banksy would prefer his work to be on display rather than stored in a collector's basement somewhere. Police have so far released no details other than to say 11 Division is investigating.